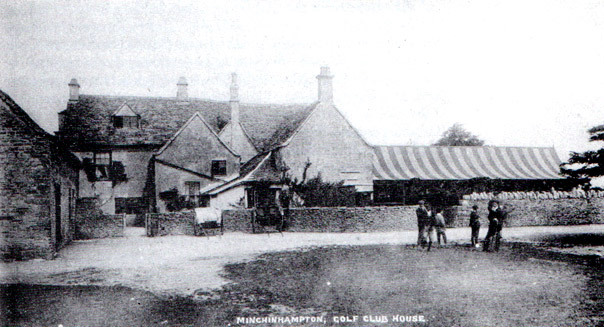 Originally called Minchinhampton Common Golf Club, the first mention of the Club appears in the listings of clubs in the 1989-90 Volume III edition of the Golfing Annual. Many of the founder members of the course were directly involved in the wool trade, and were all prominent in the local community. 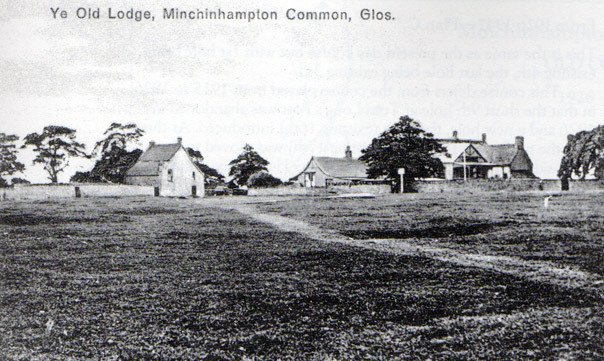 Within a year, the word "Common" was dropped from the title of the Club, which from then on became known as Minchinhampton Golf Club. From the time of the Club's inception a club room for the use of members had been provided at the Old Lodge Inn. In 1890 a notice was circulated to members giving details of a proposal to establish a club at the Old Lodge, to be called "The Old Lodge Club" for the convenience of members. With an undertaking to build a suitable clubhouse if assurances of sufficient support to make the Club financially successful were received. Having obtained financial guarantees the new club house or "pavilion" was built in the garden of the Old Lodge Inn. At a meeting of the Old Lodge Club, held on October 3rd 1891, it was resolved "that the Old Lodge Club be dissolved and that the premises and furniture be handed over to the Minchinhampton Golf Club on 1st January 1892, on the same terms and conditions as now held by the Old Lodge Club." The subscription hitherto paid to the Old Lodge Club which was fixed at £1-11/6d for Gentlemen and 10/6d for Ladies. The Old Lodge Club had served its purpose and members of Minchinhampton Golf Club had their own clubhouse. In a Committee meeting in March 1892 the Committee decided to recommend to the members that "the Rules of Golf as adopted by the Royal and Ancient Golf Club of St Andrews on 29th September 1891, be adopted by the Club". The course itself was being continually modified and improved. In March 1893 they decided to reserve special teeing grounds for Medal days, Spring and Autumn meetings. The number of matches played against other clubs was increasing year by year. Whilst the Club had permission from the Lord of the Manor of Minchinhampton and the Committee of Commoners to play on the Common this does not seem to have been in writing and no formal conditions appear to have been agreed. In 1907 the Club took the opportunity to purchase the Great Park from the Lord of the Manor who had indicated his willingness to sell land at the time. In a lease dated 31st December 1907 between the Trustees of the Minchinhampton Golf Cub and the trustees for the Minchinhampton Commoners, the Park was offered on lease to the Commoners for grazing in return for the Club's formal right to play golf and maintain the course. The agreement also allowed the Club to build a clubhouse on the Park and to construct a Golf Course there, should they so desire. Prior to the beginning of the First World War in 1914-18 full membership of the Club was an exclusive privilege, carefully preserved. Those accepted for membership were mainly landowners and owners of major local industries such as woollen mills and engineering works. Members of the professions, doctors, lawyers and the clergy; serving and retired officers of the armed forces and the sons of the foregoing. Membership categories were reorganised immediately after the war when in 1919, an Associate Members Club, known as the Old Lodge Club was formed. Membership gave the right to play on the course but not to use the clubhouse, club bar or changing rooms. Their "19th hole" was a small back room and bar in the Old Lodge itself. In 1920 the Club took a decisive step forward when they purchased outright the Old Lodge Inn and associate premises. For nearly twenty years this associate club flourished, at one time having more than 200 members. Its existence came to an end at a specially convened meeting on September 23rd 1937 when they took the decision to merge with the parent Club. A considerable effort was necessary to maintain the golf course during the period of the Second World Ward. On the outbreak of war in 1939 the Common was considered to be a potential landing ground for invading aircraft and, to frustrate this, a number of ditches were constructed over the course. Trenches were also dug and a number of concrete structures erected at strategic points. 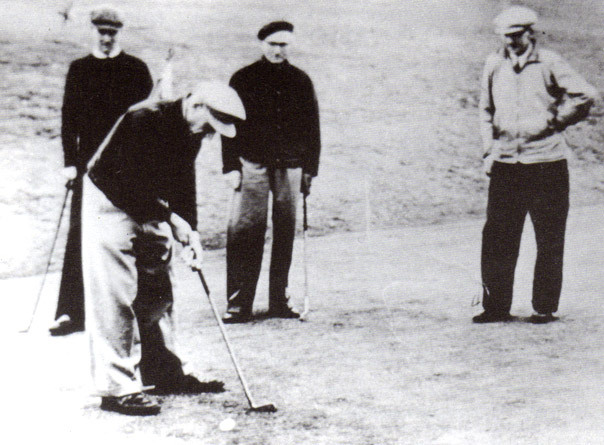 The fairways could no longer be cut at all, but despite these handicaps some golf was played. The above text and imagery taken from Minchinhampton Golf Club Centenary History 1889-1989 by David Martin.